At Canopy Airport Parking® , we work hard to provide value to our customers while also giving back to the community and making the world a better place. In honor of October being Breast Cancer Awareness Month, we are offering our customers 15% off their purchase while donating 15% of the proceeds to the Susan G. Komen Foundation. This charity has been at the helm of increasing breast cancer awareness and their efforts have directly impacted the lives of millions. Before the Susan G. Komen foundation was founded in 1982, there was little awareness of the importance of routine testing and treatment options were limited. Ever since Susan G. Komen launched their efforts, a movement to promote awareness and research has been ignited and the result has provided wider access to screenings and more advanced treatment options. Our partnership with Susan G. Komen is meant to go beyond a one time donation. We are aiming to foster meaningful and long term relationships between our customers and this amazing organization. There are many ways to support the Susan G. Komen Foundation and whether you are contributing time or money, your donation is a huge part of leading the fight against breast cancer for women everywhere. They have set an ambitious goal of reducing the number of breast cancer deaths by 50% in the year 2026. In order to achieve this bold target, they are going to need a tremendous amount of support from the community. Between events and fundraisers, there are many ways to get involved in the fight against breast cancer everywhere. Volunteers are needed at events across the United States and it is a great way to get involved with the organization. You can search for the next volunteer opportunity in your neighborhood on their website. Additionally, there are opportunities to be an advocate of legislative change that will support breast cancer research and prevention. To stay up to date about advocacy actions you can support, sign up here. Finally, your regular shopping can benefit the Susan G. Komen foundation at no extra cost. All you have to do is take advantage of the Amazon Smile program and select Susan G. Komen as your beneficiary. Simply visit the Amazon Smile website, log into your amazon account, set the Susan G. Komen as your preferred organization and start shopping! When using Amazon Smile, 0.5% of the price of your eligible AmazonSmile purchase will be donated to Susan G. Komen automatically. Finally, donations are always appreciated and put to good work. We chose to partner with Susan G. Komen because 84 cents of every dollar spent by Susan G. Komen supports mission programs and services which means our donations are going towards real change and not administrative costs and overhead. 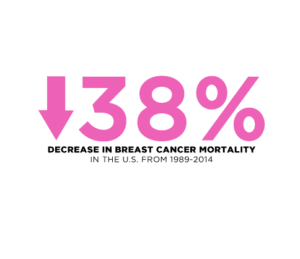 Additionally, the Susan G. Komen Foundation has donated $920 million dollars to breast cancer research, more than any other nonprofit, and have proven that they can lead the fight against breast cancer effectively and efficiently. Just remember, October at Canopy Parking® , “You save 15%, We Donate 15%.” Come in today!